Please send corrections and additions (including new events) to: Eric Holcomb. Tournament organizers – please help avoid conflicting tournaments by using this calendar! Note: TAs are not available for all events, or for some events may appear in a separate file or on a separate website. See the main calendar page for a more complete list of events. main calendar page for links to web sites and PDF files for many scholastic events. A bold listing indicates a Northwest Grand Prix (or Oregon GP) event. State membership required to qualify for Grand Prix prizes. Chess club membership may be required for some non-Grand Prix club events. Effective April 2019, OCF is taking over the Grand Prix for Oregon chess players for the remainder of this year. Weekly Events and Casual Chess Gatherings are listed on a separate page. Also, please see the club page for info about chess club regular meetings. 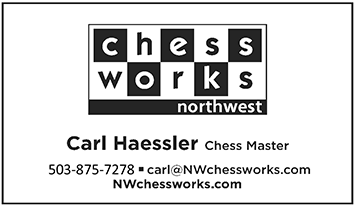 Paid Advertisements – Thank you for your support of Northwest Chess! 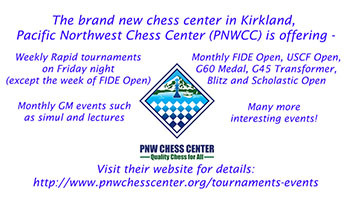 Pacific Northwest Chess Center in Kirkland offers many events including scholastic, FIDE-rated and GM. Click here for PNWCC schedule/calendar, or see online registration. Apr 19-21 8th Annual Reno Larry Evans Memorial Open, Reno, NV - See ad/flyer. Apr 19-22 Grand Pacific Open, Victoria, BC - See ad/flyer. Note: There were some changes to the PCC G/60 TA beginning in December 2018. In addition, a state membership is no longer required. Apr 20 Portland CC Game in 60, Portland, OR. Site: Portland Chess Club, 8205 SW 24th Ave., Portland, OR. Two sections-Open and U1650, 4-round Swiss, G/60;inc5, one half point bye is available if requested before round one, US Chess rated. On-site reg: 9-9:45 am. Rds: 10am, 12:30pm, 2:45pm, 5pm. Players who have a game go around the full time can request extra time off before the next round. EF: $20, $15 for PCC members (Add $5 play-up fee if play up. Pay by cash or check payable to Portland Chess Club.). US Chess membership is required and can be purchased during registration. Prizes ($300 b/30; any play-up fees are added to the prize fund). Open section: 1st-$60, 2nd-$40, 1st U1850/unrated-$35; U1650 section: 1st-$60, 2nd-$40, 1st U1450/unrated-$35, 1st U1250/unrated-$30. OSCF State qualifier. More info at pdxchess.org. Phone: (503) 246-2978. Apr 23 Portland CC Tuesday Quads (Rd 4 if needed), Portland, OR. Site: Portland Chess Club, 8205 SW 24th Ave, Portland, OR Map. Three round quads, usually with one round on each of the first three Tuesdays in the month. Some or all the sections may run as a round robin or Swiss with more than three rounds and four players mainly due to the number of players and number of Tuesdays in a month. 40/90,SD/30;d5, US Chess rated. On-site reg: 7:15-7:30. Rounds begin each Tuesday at approx. 7:30. By agreement players may schedule their game at another day and/or time if it’s scheduled after the previous Tuesday night and before the following Tuesday night. EF: $15, $10 for PCC members (pay by cash or check payable to Portland Chess Club). US Chess membership is required and can be purchased during registration. Winner of each section receives $10 discount on the entry fee to one of the next three PCC Sunday or Tuesday Quads. If there is a six or seven player section, the runner-up receives $5 discount. More info at pdxchess.org. Phone: (503) 246-2978. Apr 27 Seattle CC Saturday Quads, Seattle, WA. 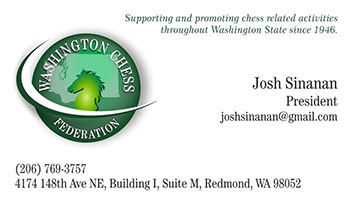 Site: Seattle Chess Club, Northway Square East Building (2150 N 107th St), Seattle WA. Format: 3-RR, 4-plyr sections by rating. TC: G/120; d5. EF: $9 (+$7 fee for non-SCC). Prizes: Free entry for future quad. Reg: 9:00-9:45 a.m. Rds: 10:00- 2:15-ASAP. Misc: US Chess, WCF/OCF/ICA memb. req’d, OSA. NS, NC. Infoline: 206-417-5405; e-mail kleistcf@aol.com. Register at http://seattlechess.club/. Apr 27 Portland CC Unrated Rapid, Portland, OR. Site: Portland Chess Club, 8205 SW 24th Ave, Portland, OR 97219. 6-round Swiss in one section, G/15;inc5, on-site reg: 9-9:45am, first round starts at 10am and the subsequent rounds start ASAP. EF: $10, $5 for PCC members (pay by cash or check payable to Portland Chess Club). Chess book to the first place finisher. Additional rating based chess book prizes may be awarded, on TD discretion, based on the number of players. More info. at pdxchess.org, (503) 246-2978. Apr 28 Portland CC Sunday Quads, Portland, OR. Site: Portland Chess Club, 8205 SW 24th Ave., Portland, OR - Map. 3-round quads. Some or all the sections may run as a 3-round Swiss with more than four players. The "live" US Chess regular ratings are usually used for section placement and pairings. G/50;inc15, US Chess and NWSRS rated. On-site reg: 9-9:45am, Rds: 10am, 12:30pm, 3pm. Rounds 2 and 3 can be started earlier if both players agree. Players who have a game go long can request extra time off before the next round. EF: $15, PCC members $10, $5 discount for each additional family member who lives in the same household (pay by cash or check payable to Portland Chess Club), free entry for players who are playing in their first US Chess rated tournament. US Chess membership is required and can be purchased during registration. Winner of each section receives $10 discount on the entry fee to one of the next three PCC Sunday or Tuesday Quads. If there is a six or seven player Swiss, the runner-up receives $5 discount. Bonus scholastic awards: trophy for winning section with 3 points; smaller trophy for winning or tying for first with 2.5; medal for winning or tying for first with 2 or 1.5. OSCF State qualifier. More info. at pdxchess.org. Phone: (503) 246-2978. Apr 28 Olympic Chess Club Championship, Naval Lodge Elks Building, 131 E 1st St, Port Angeles, WA. 4 Rd. Rated Open Swiss. 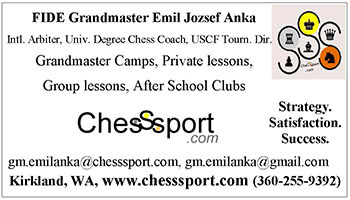 US Chess membership required. Time control: Game in 30 with 30 sec. inc. Round times: 12pm, 2pm, 4pm, 6pm. Prizes: 1st $70 + trophy, 2nd $50, 3rd $25, top U1200 $20 (based on 20 players). Entry fee: $10 if registered by April 26th, $20 after. Arrive early and bring equipment. Trophy by Zack Ripley. 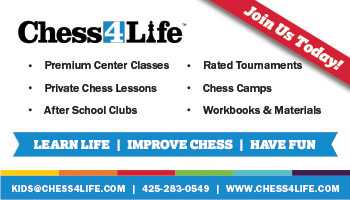 To advertise your chess school/camp, please contact the Northwest Chess Business Manager at info@nwchess.com. Cost: (includes magazine ad) $125.00 full year, $65.00 summer camp season only. May 4-5 Penguin Extravaganza, Portland, OR. 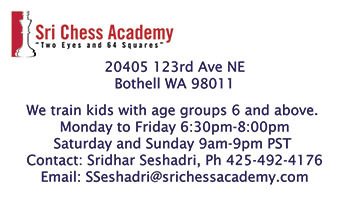 Site: Portland Chess Club, 8205 SW 24th Ave, Portland, OR 97219. 6-round Swiss in two sections, 1700+ (Premier) and U1700 (Reserve). Playing up is not allowed. The most current (“live”) US Chess regular ratings are usually used for section eligibility, pairings, and prize eligibility. TC: G/60;inc30. Up to two half point byes are available if requested before round one. US Chess and NWSRS rated. On-site reg: 9-9:45am. Rds: 10am, 1:30pm, and 5pm each day. The second and third rounds each day can be started earlier if both players agree. Players who have a game go long can request extra time off before the next round. EF: $40, $30 for PCC members (pay by with cash or check payable to Portland Chess Club). 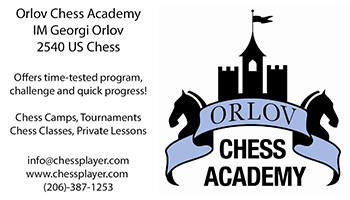 US Chess and OCF memberships are required and can be purchased during registration (OSA). Prizes ($1000 b/40): Premier: 1st-$200, 2nd-$150, 1st U2100, 1st U1900-$125 each; Reserve: 1st-$150, 2nd-$100, 1st U1500, 1st U1300/unrated-$75 each. Qualifier for the Challengers section of the Oregon Closed and qualifier for the OSCF State Championship. More info. at pdxchess.org, (503) 246-2978. May 11 Emerald City Chess Club Spring Open, Eugene, OR - See flyer. May 12 Seattle CC Sunday Tornado, Seattle, WA. Site: Seattle Chess Club, Northway Square East Building (2150 N 107th St), Seattle WA. Format: 4-SS. TC: G/60; d5 (or G/64; d0). EF: $18 (+$7 fee for non-SCC). Prizes: 1st 35%, 2nd 27%, Bottom Half 1st 22%, 2nd 16% ($10 from each EF goes to prize fund). Reg: 10:30-11:15 a.m. Rds: 11:30-1:50-4:10-6:30. Byes: 1 (Rd 3/4–commit at reg.). Misc: US Chess, WCF/OCF/ICA memb. req’d, OSA. NS, NC. Infoline: 206-417-5405; e-mail kleistcf@aol.com. Register at http://seattlechess.club/. May 18 Redmond Quads, Redmond, OR - See flyer. May 18-19 Inland Empire Open, Spokane, WA. Site: Gonzaga University (Jepson Center) Room 109. Format: Five Round Swiss System. Registration: Sat. 8:30 a.m. - 9:30 a.m. Rounds: Sat. 10:00-2:30-7:00, Sun: 9:00-1:30 or ASAP. Time Control: G/120 (with 5 second delay). E.F. $23 if received by 5/17, $28 at the door; 18 and under $5 less. Telephone entries accepted. $630 prize fund; Class prizes based on at least five per section. Only one prize per person (excluding biggest upset). NS, NC, W. One ½ point bye if requested before proceeding round. Sunday byes must be requested before the end of round 3. Director reserves the right to use class pairings in the final round. Prizes: 1st Overall: $140, 2nd Overall: $100; Class Prizes: 1st (A; B; C; D/E/unrated) $60, 2nd (A; B; C; D/E/unrated) $25, Biggest Upset: $50 (non-provisional ratings). Entries: Spokane CC, c/o Kevin Korsmo, 9923 N. Moore, Spokane, WA 99208. Information: cell (509) 270-1772, website www.spokanechessclub.org. May 18-20 44th Annual Keres Memorial, Richmond, BC - See ad/flyer. May 25-27 Washington Open, Lynnwood Embassy Suites, Lynnwood, WA - See full-page ad/flyer. Note: Per the new advertising policy adopted by the NWC board in April, most website event ads (except scholastic) are no longer free. If an event is not advertised in NWC magazine, the fees for a website-only ad will be $10 for the calendar page only, and $15 for both the calendar page and this page. We will soon add a convenient online form to request and pay for these ads. Dec 14 Western Idaho Open, Boise, ID. 4SS, Time Control: G/60;d5. Site: Riverside Hotel, Boise, Idaho. US Chess & ICA/OCF/WCF mem req. EF: $30 per player. Discount for online registration. Check in: 9:00-9:30 am. Rd. times: 10:00 am, 12:30 pm, 3:00 pm, 5:30 pm. 1/2 pt bye avail any round: Max 1, Notify TD before Rd. 2 is paired. $$ (based on 30) 1st - 3rd place Overall $100, $75, $50. $50/class: U1800, U1600, U1400, U1200, U1000, unr. Details: idahochessassociation@gmail.com, Online registration at www.idahochessassociation.com, (208) 450-9048.